Speaking from the Diplomatic Reception room at the White House Wednesday, President Trump officially declared the United States recognizes Jerusalem as the capital city of Israel. 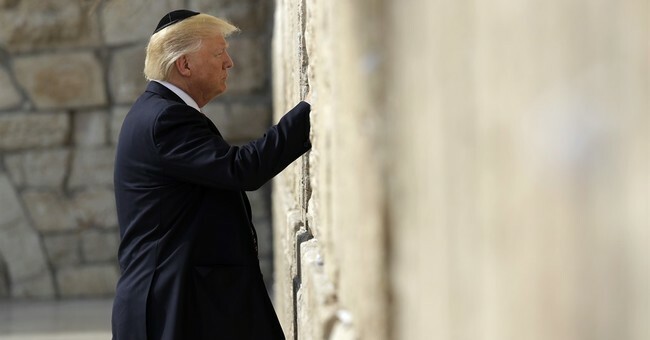 “I have determined that it is time to officially recognize Jerusalem as the capital of Israel," Trump said. "This is a long overdue step to advance the peace process...today, we finally acknowledge the obvious: that Jerusalem is Israel’s capital. This is nothing more, or less, than a recognition of reality. It is also the right thing to do. It's something that has to be done." In his remarks, Trump said the recognition of Jerusalem as the capitol is essential to peace talks moving forward, a message to Palestinian leader Mahmoud Abbas. The President repeatedly addressed concerns about a peace agreement between the Israelis and Palestinians being hindered as a result of the recognition. He argued failing to move the U.S. Embassy from Tel Aviv to Jerusalem, as verified by law and Congress through the Jerusalem Embassy Act, has done nothing to move the region closer to a peace deal. “We cannot solve our problems by making the same failed assumptions and repeating the same failed strategies of the past. Old challenges demand new approaches," Trump said. "The record is in, after two decades of waivers, we are no closer to a peace agreement." The President said he is committed to the peace process and will support a two-state solution so long as both the Israelis and Palestinians agree to it. "We want an agreement that is a great deal for the Israelis and a great deal for the Palestinians," Trump said. "I've judged this course action to be in the best interest of the United States of America and the pursuit of peace between Israel and the Palestinians," he continued. "My announcement today marks the beginning of a new approach to the conflict between Israel and the Palestinians." After making the announcement, Trump signed a proclamation. In response to the announcement, the Old City walls in Jerusalem were lit up with the Israeli and U.S. flags side by side. This post has been updated with additional quotes.